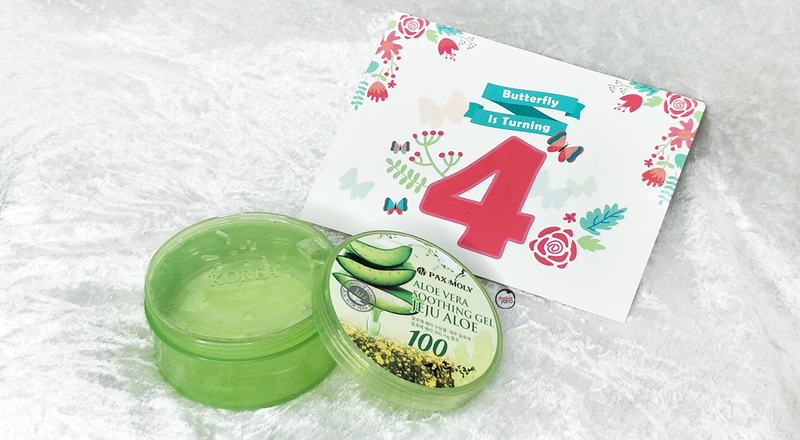 So today, I will be introducing to you a soothing, affordable and multipurpose Jeju aloe vera gel from Pax Moly. Truthfully, this is my first time hearing about this brand. I don't have to 'rant' about the goodness and the benefits of aloe vera gel as we all have been using them ever since we were young especially when we needed to treat sunburns, burns, scars and wounds. Sometimes our parents or grandparents would also smother a good amount of aloe vera on our face for some mask time. Besides using this soothing gel for the reasons mentioned above...did you also know that you can use aloe vera for your hair to strengthen and prevent breakage? I got to know this neat and cheaper trick from Michelle some time ago. If you ever wondered why my hair has been always thick despite the endless hair colouring, then now you know my secret. So what are you waiting for? Now that you have more reasons to own one good tub of aloe vera, go and get yourself a Pax Moly Aloe Vera Soothing Gel Jeju Aloe today! i use this too!! they really moisture and it really helps on my dry skin! I have never tried aloe vera gel from this brand. But seems like a good try! First time I hear about this brand. It is nice to use? I always have a tub of aloe vera gel at home. Its so useful and multi-purpose. Aloe Vera are one of th must have products at home, love how multipurpose it is!